Le Nuancier du Cirque is a compendious video anthology of the last couple decades of French circus – in all 178 extracts from almost as many companies, spanning two DVDs and six hours. 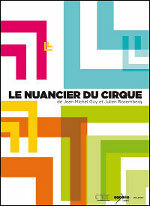 Translated, Le Nuancier du Cirque means something like The Shades of Circus, with the first DVD (The Circus Spectrum) tracing some of the roots of the contemporary circus, and the second (Aesthetics) beginning to lay out categories for the different performance styles that now proliferate. You can read a long appraisal of the contents and the presentation here, but the main points are that: it is probably of highest value for researchers, programmers and circus nerds; you don't need to speak French (there are introductory mini-essays that are translated to English; some of the extracts have speech that isn't subtitled, but not so many); a lot of the material isn't available elsewhere online; it doesn't matter how hungry you are for circus videos, you will eat your fill; French circus is the best, or at least the biggest. The publishers are also planning to release further, themed DVDs, and to link these with searchable online archives – so keep an eye on things. Les Cousins, Y'a pas de quoi rire! Compagnie Le Nadir, ex madame v.
Compagnie Max et Maurice, Oups!